♥Hello Sweethearts♥ Is me again and I guess you guys should know what is Shopcation!! Am I right? Because I normally do live update on my insta / facebook before I put the details on my blog. So yea, shop-cation actually stands for Shopping Vacation. Remember my short getaway trip to Singapore (click here to read more) last month? Yes, I spotted the poster of #GreatSingaporeSale (GSS) everywhere in Orchard road and around the shopping complex. Then I also get to do a little shopping in Ion Orchard. I bought a Samantha Thavasa diary book that I aimed since months ago during my trip to Japan and visited Kikki.K too. I never thought I could get it such good discounts because normally people might go shopping in Malaysia but ended up I realise I can really get good deals everywhere in Singapore. Ps: Read til the end because you could win away a shopcation trip to Singapore too! Yes! not sure if you took note of this or not, but their GSS came earlier than our sales period in Malaysia and what I found special about the GSS was that big brands like Zara, Topshop, H&M are having crazy sales at least 40%-70% discounts. Some of the brands that I really love but couldn't get in Malaysia will be the Kikki.k (they sell all pretty stationery items), Samantha Thavasa, The Editor's Market, Stradivarius & so on. Then the moment I saw posters with GSS tagline on it, I just keep shouting like a crazy women! Plus, it was also a Birthday Trip for Smelly. So he will be following me to explore this beautiful and clean country with lot of sales during the whole trip. Ended up I feel like I'm the one celebrating my birthday lol. But seriously, for those brands which not available in Malaysia, it's really cheap with lot of discounts especially during GSS. Damn, let me show you how I'm able to find those hidden gems *devil smile* I'm so proud of myself now. Also, have to give you guys a shout-out loud to those who commented on my instagram photo during the first day of my Shopcation trip. You guys were so helpful and I never thought I could get those precious information from all of you! It took me 2 hours to come out with a mini 'report' after looking through and read all the dm & comments on my Instagram but honestly, a big thank you for you guys for being so helpful! I'm gonna cry! Hopefully this ‘shop-cation’ trip post can help to inspire you guys to shop and save at the same time during this key shopping periods. Here are some of the places that you guys recommended + I went to shop during my 4D3N shopcation trip in Singapore. Since most of the time (especially during Shopcation) I mainly engage more on insta stories because that's the best way to spam my stories with those hidden gems that I found during GSS. So I didn't really take photo with my camera because I just really focus on shopping and just simply snap some photo for me to create some shopcation content on my blog. So here's some of my shopping experience and let see what I found during my Shopcation. I'm just interested on the $7 corner! HAHAHAAH So this is how a budget person get to find those hidden gems lol. I spotted 'Buy 3 get 1 free deal and even cash rebate! OMG It's the time when I could shop til I drop and I have someone to carry all shopping bags for me. HAHAHAHAAH That's the reason why Smelly tag along lol. Luckily I'm not coming with my girlfriends. If not I'm sure I will KO. Look at all the red color sales poster and promotions. I tell you most of them are 40-70% discounts!! All the shops are offering further markdown on the price to attract people to go in lol. Be a smart shopaholic, go to look for the cheapest one first before going back to take a look on the higher price one HAAHAHAHAH. MUJI also joining the Great Singapore Sale!! I realize getaway trip to Singapore last month was the beginning of GSS period, and the sales items and amount of discount is really different from that time. This time there are further price markdown by some brands such as Kate Spade with 50% discounts on their wallet and most of them are nice designs, not those ugly ugly ones! Then, Super Dry and Gap were having extra and further markdown sales too. I tell you Smelly was so happy when he spottted the further markdown sales from GAP & Superdry. Zara. I think their sales in Malaysia are quite diff. If you come to Zara in Singapore you can find good and nice jackets at cheaper price. Why I look for jacket? Because I'm a jacket / outerwear lover! HAAHAHAH Also, the price is good but if compare to H&M, of course H&M are better than Zara. My favourite brand! Last time I shop Bershka most was in Osaka, Japan because the collection was quite different compared to the one in Malaysia. I never thought Singapore would be selling the same jacket that i bought in Osaka way cheaper. I only bought a top from here because I almost out of budget already. So I just keep some budget for others AHAHAHAHA. This one is just SGD90 Wahhhh!!! I think the best part of shopcation trip is the feeling of satisfaction you get each time you bought something cheap and it's also healthy in a way that you keep walking and feel so excited. AHHAAHHAAHAH This is something that will never happen when you shop online lol. Once in a blue moon ya! HAHAHA I will feel the pinch in my wallet if i shop like this everyday lol. Our HomeAway owner was super kind, the owner wrote everything on the website so I just pay a visit to this City Square Mall since it's somehow nearby my HomeAway stay. Besides this shopping mall there are lot of nice Cafe (will share it later and also wanted to come out with another post on it because I took too many photo lol) with only foot walking distance. At night, we just walk down from our house, get our snacks or supper nearby & enjoy watching TV at our HomeAway stay. Also, for those who read my instagram post you know that our HomeAway apartment has a private jacuzzi and swimming pool. OMG! Okay, I shouldn't out of topic here. Will share it later and I should continue the GSS details lol. Charles and Keith is actually quite low profile without many red posters but only put one SALE poster in front of the corner / some beside the entrance. At first I never thought the sales can be 50% discounts so I was like, okay maybe should go to try their sunglasses because you know right, my face is really small and most of the sunglasses are either too big covering half of my face or just not simply doesn't suit me. But I realized that Charles & Keith sunglasses look really good on Asian's face shape. It's 100% UV protection for your eyes and made of good quality too. I have 4 pairs of their sunglasses and all are really nice! WAH who's this chioo zhaboooo! Just like visiting Japan if you really do some homework you know where to find cheap food and good deals. Here's the Italian dining restaurant that we really like because they served all our favourite food are cheese, bacon , salmon, corn!!! WOOOOHOOO! My favourite food all in one! Bacon, corn, cheese PIZZA! Since most of you told me that Jurong is really nice to shop and I can't make it during my previous trip to Singapore. So here's the chance for me to shop til drop OMG! IMM the largest shopping mall in Singapore with over 80 shops available. My friends told me that it's far but is not that far la. Less than one hour can reach but it's definitely worth for your visit. 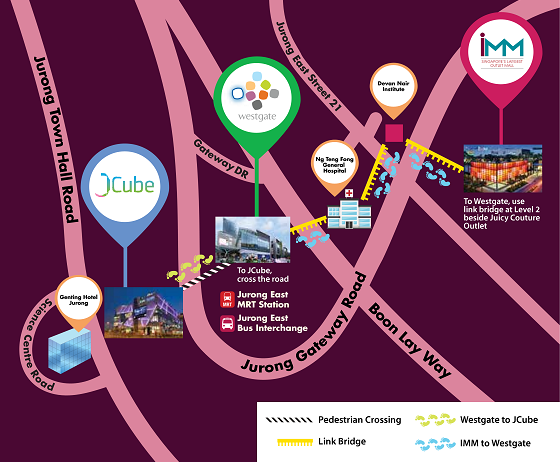 Right after you reach Jurong East train station you can easily spot Westgate on your right and Jcube on your left! Jem is right behind Westgate and IMM can be reached by few mins' walk 4 linked shopping mall. Shop til you drop! TOKYO HANDS is having GSS too!! WHAT?!!! Time to sapu back to Malaysia. Jem is just right behind westgate! I love this brand a lot! Without sales it's quite pricy la something like top shop or miss selfridge pricing but with sales IT'S REASONABLE! Spent 1 hour 30 mins here wtf! So focus and i ask Smelly to take photo of me if he got nothing to buy so who know the photo he took is just all my upper body with the items lol. Should take more about the sale item lol. But really worth I bought 3 items from here. I love the yellow jacket the most! End of the day you can treat yourself a nice dinner. Hai Di Lao hot pot is also located at IMM but I went to the one in Orchard because I'm meeting with my friends there. Also, accidentally met 2 of my followers and readers at orchard road! HAHAHAHA This was really a surprise for me! If you are reading this, a big hug for you guys! Lastly, crazy shopping at Orchard Road. Went to Ion orchard, somerset and takashimaya! This is the last chance because the next afternoon (the next day) I'm going back to Malaysia. Okay la enough of this. Just buy CHANWON!! Bought 3 items from here and I refuse to walk to the accessories corner because it's getting late lol. I still need to go Kikki.K and Samantha Thavasa to check whether is there any sales or something that worth the value so I can share it with you guys! Kikki.k GSS last month is mostly 50-70% but it's old collection mainly planner and this time I back, I saw and spot the new promo items which is mostly 40-50% discounts almost half price. Mostly nice and pretty house decoration items and table/ desk essentials. Planner also having 60% sales and since I shared it last time on my blog I think I should skip that. Samantha Thavasa has lot of pretty bag and it's really famous in Japan. I bought mine last month and now I just try my luck. Mostly wallet and only some bags left because I believe most of them were sold. Haix, I spotted a pink bag last month during GSS with 60% discount and it sold out. I feel so sad why I don't use debit card during my previous visit. wth!! So my advice is, bring more cash because using debit or credit card might not worth and can be really expensive for it ya. I feel sad I couldn't get the bag I want so I just leave there with empty hands lol. I love the service when shopping in Singapore especially when you enter those branded shop. It's completely different from Malaysia. The pretty sales girl see my outfit and stand really far to check whether what else I like. Then I just stand beside don't dare to do anything because mostly when I enter branded shop in Malaysia, it's either someone staring at me or when I ask for the price, they ignored me lol. Okay I should stop dreaming and one day I will buy you home BABY!! 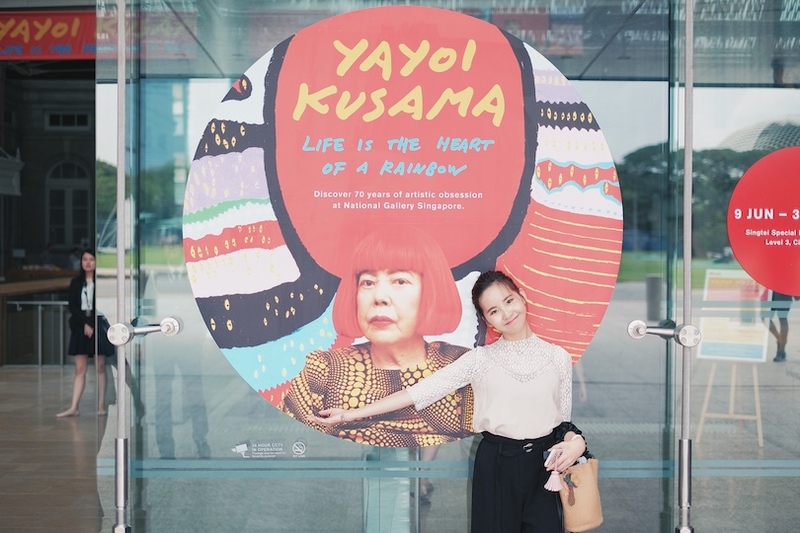 Other than shopping, we also went to the National Gallery Singapore for the Yayoi Kusama exhibition. The exhibition was full of polka dot, pumpkin, rainbow color and a infinity room. I wanted to visit the other exhibition in art science museum Singapore next time. Hopefully it's still available! Now in Universal Studios Singapore. Bought my fluffy unicorn backpack here and this is where I spent my precious time with Smelly. AHHAAH Must take a photo in front this castle because this is something not available in USJ. I love castle and it's just so dreamy for me. Special shout-out to Jetstar which surprised us with the extra legroom for both of us. OMG Smelly was super happy because we no longer need to restrain our legs within a small space and fyi, Jetstar flies from KLIA2 to Singapore, up to five times daily. One way, all-in fares start from just RM44! Besides, the flight timings of Jetstar is really convenient! So next time if you are going to Singapore, feel free to give this a try. Then during our check-in time for your return flight. We check in with Jetstar's brand new kiosks and bag-drop counters at Changi T1 row 8, too easy and convenient. Just 2 mins check in without long queue! OMG Like what I experience in domestic flight in Japan. Selected an extra legroom and Upfront seat! So that we can be the first to board and first to disembark without the need of waiting! It's not the first time I'm enjoying my rental vacation via HomeAway. Remember where I stay during my Setouchi Japan trip and my previous trip to Singapore?? I love the benefits of staying in a whole private apartment without the need to share with other strangers. Since this was also a trip to celebrate Smelly's birthday. I decided to book something that's really special and this lovely apartment has a nice interior that makes me feel like my HomeAway from home. It comes with a private Jacuzzi and a huge swimming pool but the swimming pool is like our own swimming pool because no one actually go to the pool lol. Then a skylight on the top of your bed. I want to have some bonding time with loved ones. I think this was the reason why I decided to stay with HomeAway again. Either with a group of friends , your family or your loved ones...This can really make help to create an unforgettable travel experiences and helps to create lasting memories during the vacation period. Perfect vacation rental is something that makes me feel like home when I'm away from my own country. Whether you are planning a girls’ getaway, shopping,winery and food tour, a romantic weekend or just a short getaway, a whole vacation home is a great alternative to hotel. How we spent at night! Relax and chill on the living room, enjoy our snacks / supper & this is our simple happiness. You can turn on the TV anytime as many time as you like. Happy Birthday my love Smelly! Hope you enjoy your vacation and your stay! Where you stay can also make a difference. My shopcation trip won't be so perfect without our HomeAway stay! Having a private homestay is good for shopping trip because it's convenient, spacious, can relax in the house, cook, do your laundry and so on. I love to use the washing machine to do free laundry for our new clothes, prepare simple breakfast or snacks from groceries shopping near our apartment, a much bigger spaces for us and lastly good view from our private jacuzzi! There are few hidden gems (not tourist spot at all) around our area. It's just 1 min walk to the nearest Cafe (My favourite, Enchanted Cafe). That's all for today. You can book for any date but the promo need to be used by 30 Sep 2017 ya. No need to wait, just book it now! 2. Comment on my instagram giveaway post (click here) and tell me WHY you want to take a shopcation in Singapore. *Shopcation prize consist of a pair of economy class return tickets for two from Kuala Lumpur, Malaysia, to Singapore, provided by Jetstar Airways Pte Ltd and a HomeAway voucher worth SGD$600 or equivalent amount in local currency. -Which means that you can use the SGD600 to book for your favourite stay via HomeAway. You can either make it a shopcation trip staying with a nice apartment or staying at this private jacuzzi apartment too. Contest ends on 24 July 2017. Good luck! That's all for today. Good luck everyone! Love, xoxo. Its nice you have given some nice information about singapore.